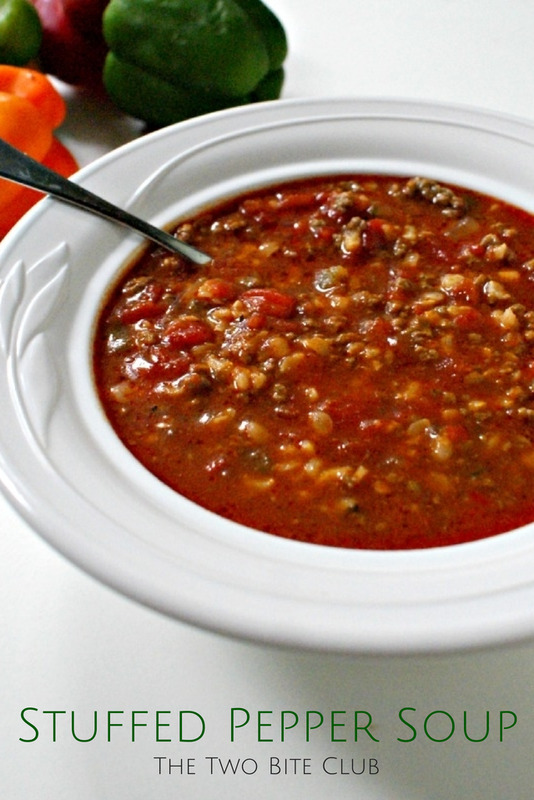 Stuffed Pepper Soup is an easy to make, hearty and family-friendly soup that features all of the flavors of classic oven baked stuffed peppers. When I was thinking about what I should make for dinner the other night I knew that I had to come up with a recipe that would use up some of the bell peppers I had in the fridge. We're growing them in our garden and we have tons of green, orange and red ones that are on their way out. I thought about making stuffed peppers or fajitas, but I decided I'd try a recipe I'd never made before. I remembered seeing Stuffed Pepper Soup on Pinterest, so I googled it and found the perfect recipe on Skinnytaste. Yes, I made soup in the middle of summer. I'm a year-round soup kind of gal. I had all of the ingredients on hand (always a plus), it came together in no time, AND my husband and my kids scarfed it down. Win! I am happy to add this family-friendly soup to the meal planning rotation! If you're looking for a stuffed pepper recipe that's not a soup, check out my Simple Stuffed Peppers, a family favorite! In a large pot, brown ground beef over medium-high heat. Add the peppers, onions and garlic and reduce the heat to medium. Cook for 5 minutes or until the vegetables have softened. Season with salt and pepper. Add the tomatoes, tomato sauce, chicken broth, marjoram and season with additional salt and pepper to taste. Reduce the heat to low, cover and simmer for 30 minutes. Spoon into bowls and top with a scoop of the rice before serving. Stuffed peppers are one of my favorite meals, and I love the idea of turning them into a soup! Soup in the summer is totally acceptable when it's this delicious! Agreed! Thanks for commenting, Kristine! Can you throw everything in a crockpot for 4 hours on high and everything get done?? I haven't tried it that way, but I think it would work. I think I would cook the rice separately and add it at then end though. When do u add the chicken broth? Should the cans of diced tomatoes be drained, or should the liquid be added as well? They should not be drained. Just dump the whole can in! It looks like there is corn in the picture of the soup..or am seeing something else? Why is the rice added in the bowl instead of in the pot? You can add it to the pot if you want to. I just like the rice scooped on top because then the rice has no chance of getting mushy. right on about the rice getting too soft. like the idea that you add the rice in the end. wonderful soup idea.